Ancient Greeks and Romans considered Elecampane root as a cure-all for a broad range of ailments. It was considered to be a useful herbal remedy for dropsy, menstrual disorders, digestive upsets, and sciatica. A distinguished Western herbal energy tonic that affects the spleen, lungs, and heart. Elecampane is used for decreasing the level of cholesterol, to purify the blood and for preventing the forming of ulcers. Elecampane was used as an herbal cold remedy and is believed to promote sweating and bring up phlegm. Herbalists today still rely on Elecampane to relieve bronchitis, asthma, emphysema and whooping coughs. It has been beneficial to all pulmonary and catarrhal affections. Elecampane is an exceptionally rich source of inulin, a polysaccharide, that is sometimes used as a sugar substitute for diabetics. This herb is the richest source of insulin. Elecampane also has a long history in veterinary medicine as an effective remedy for skin disease and has been found to be beneficial in the treatment of psoriasis and eczema. The extracts from the herb kill methicillin-resistant Staphylococcus aureus (MRSA). Externally, it has been used for scabies, herpes and other diseases of the skin. It is a traditional remedy for intestinal worms, such as roundworm, threadworm, hookworm and whipworm infestation. Elecampane may also be helpful for patients with cardiovascular disease to ease the stress on the heart caused by shortness of breath, and by providing better pain relief than nitroglycerin in some people with the disease. It has been found to relieve all kinds of pain, especially those that arise from chills and animal bites. Elecampane has a mild sedative effect and has been found to be helpful in promoting sleep and relaxation. This extract has been shown to have a direct effect on moods and can assist with negative feelings and depression, also it relieves stress and tension headaches. Due to its diuretic effects, Elecampane detoxifies the body and relieves rheumatism. It can nourish hair and nails by providing them with oxygen. Today, Elecampane tinctures are used primarily for respiratory ailments and regular intake of this herbal tincture can relieve symptoms of colds, asthma, and chronic bronchitis. Inula magnifica is particularly beneficial in the treatment of bronchitis in the elderly and congestive complaints in children. It is a relaxant that is indicated when there is a nervous component in a cough. 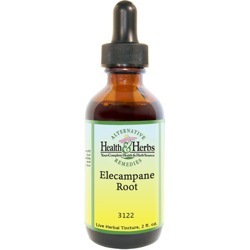 Elecampane root extract is used with Echinacea for tuberculosis, emphysema, pleurisy and whooping cough. Elecampane's antibacterial properties have been known to kill ordinary bacterial organisms, also being particularly destructive to the tubercle bacillus. A rich source of inulin, it is used to relax the lungs. Volatile oils in the root provide expectorant, anti-inflammatory and warming properties that help break up congestion and calms coughs. Elecampane contains all the minerals and vitamins that the body needs to strengthen its immune system. Japanese scientists have recently discovered the Elecampane extract can help fight free radicals from elements that include environmental pollution and stress. Internally, it is known for stimulating the process of dissolving fat and detoxifying the body. In the investigation of components of Ginger root and Elecampane root extracts, it was found to have antiproliferative properties which may be beneficial to prevent constipation-related cancer. The effects of the extract have been shown to have a highly selective toxicity toward four different tumor cell lines. Elecampane root extract provides many benefits to the gastrointestinal system by treating the irritations of mouth tissues, intestinal tissues, and stomach tissues. Studies done on this herb have shown two other active ingredients that are useful in expelling parasites, including worms from the intestines. This research also the traditional use for healthy digestion. The rich amounts of inulin present in the herb help to lower blood sugar levels and may be beneficial for diabetics. The inulin helps to stabilize the blood sugars and improve absorption of nutrients from food. Elecampane also helps to promote "good" intestinal bacteria, which ensures regular bowel movements. It boosts and protects this beneficial bacterial growth in the colon and suppresses harmful bacteria growth, and so may be helpful in the prevention of colon cancer. The plant's bitter tonic properties can stimulate the appetite and useful in the treatment of debilitating conditions. With Elecampane's ability to improve digestion, you can rest assured that your cells are getting all the energy they need. Elecampane is a liver stimulant and is called a "chologogue," an herb that stimulates the flow of bile from the liver into the intestines, which is very useful for hepatic ailments, further helping digestive disorders. Elecampane is a powerful diaphoretic and increases perspiration profusely, helping to reduce fevers and cleanse toxins from the body through the skin. Elecampane is also a diuretic that has been used to help people whose urine has stopped or who have difficulty urinating. It is also thought to reduce water retention and may be helpful in the treatment of edema. The superbug, MRSA, the bacterium that is the root cause of many infections, Horse-heal, or Elecampane root, has been found by researchers to be 100% effective against MRSA colonies. As a topical remedy for skin, Elecampane root tinctures have anti-inflammatory properties that help to relieve rashes, eczema, psoriasis and other types of skin inflammation. The alantolactone in the roots appears to be responsible for its healing benefits. You can easily prepare a wash using the liquid extract of Elecampane root. It has also been used for the treatment of scabies, herpes and other skin diseases, from which it received its common name of Scabwort. It has been used in cosmetics to help heal the marks left by acne and also for washing hair, as it relieves all irritations, including itchiness and irritation. Elecampane promotes the menstrual flow and is beneficial in the treatment of anemia. It is an effective herbal remedy for alleviating the unpleasant effects of menopause. This is due to the high quality of minerals that it contains, which enables it to feed the blood as well as treat back pains. The herb is effective in calming stressful moods by inducing a state of tranquility and relaxation, followed by sleep, as well as it relieves tension headaches and stress. New developments in research have claimed that Elecampane may be of great help in cases of congestive heart failure. In clinical studies, the herb was said to relieve shortness of breath caused by exertion and may (in the correct dosage) provide more pain relief than nitroglycerin. Ingredients: Elecampane Root, Structured Water, 20% Alcohol. Non-Alcohol: Elecampane Root, Structured Water, and Vegetable Glycerin. Contraindications: Pregnant or nursing women should not use Elecampane. Those who suffer from allergies to members of the daisy family (ragweed, asters, sunflowers, etc.) should consult a doctor before using this product. Diabetics should not use Elecampane without consulting a physician, and overuse (more than recommended dosage) may cause vomiting, diarrhea or an unusual heartbeat.